Editor’s NOTE: Though the product has some shortcomings, we wanted to show you guys the Hyskore Bench Beast Coaxial Competition Rest because it has some interesting engineering features (such as the scissors-jack primary elevator). The front bag holder won’t accept very wide fore-ends, and the high sides of the rear rest compromise your ability to get in close to the gun and work the rear controls while aiming. Still, there are few integrated front/rear rests on the market, so we thought you’d want to see this new offering from Hyskore. 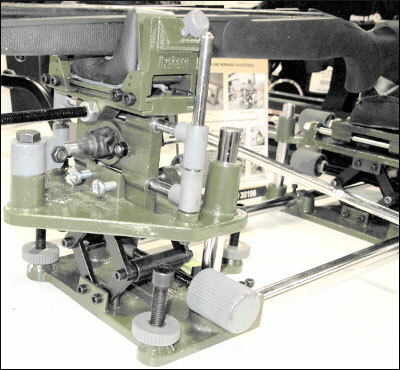 At SHOT Show 2012, Hyskore unveiled an combined front/rear mechanical rest system appropriately named the Bench Beast. The front rest has a coaxial-type control activated by a long, angled joystick. 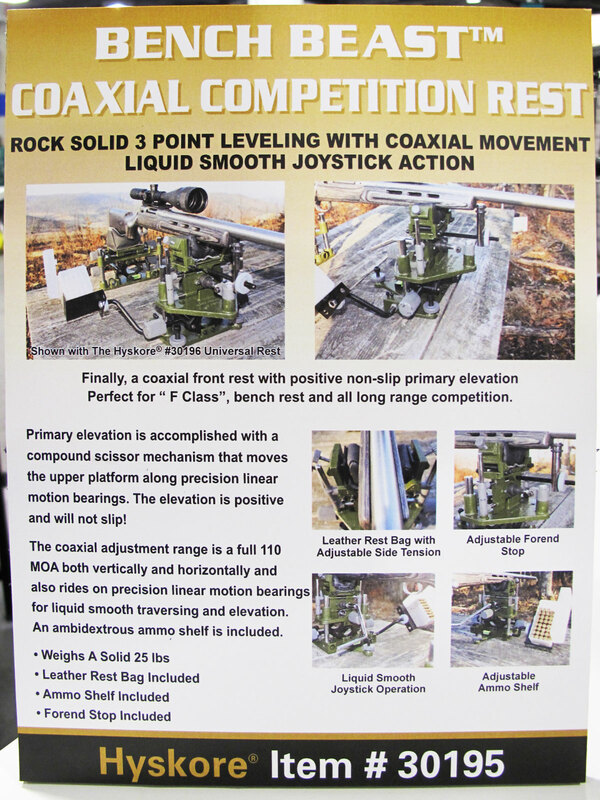 Hyskore claims the joystick control provides 110 MOA adjustment for both windage and elevation. For gross elevation changes, this contraption uses a scissors-jack type lift in the front that is definitely industrial in origin. In fact, the Bench Beast looks like something made in a Latvian tractor factory. But this may be useful for someone who wants a linked front and rear mechanical rest that can support a very heavy rifle (50 lbs. or more). It looks like the max width in the front is limited to 3″ so this would not work with a super-wide stock without modification. Too bad. Moreover, the front bag supplied with the Bench Beast is designed for narrow, hunter-style fore-ends. Even to run a 3″-wide gun, you’ll need to purchase an aftermarket bag. While Hyskore calls this a “competition rest”, the Bench Beast is not really set up for competition rifles. The front and rear units can be purchased separately. Exact pricing is not yet set, but the front section should cost about $300, with the rear priced about $200.00. People should note, however, that, if you have full windage and elevation adjustment in the rear, you really only need gross height control in the front (to get on target). With a good rear rest, all the fine windage and elevation adjustment can be done from the rear, and, because of the geometry, a little bit goes a long way. It would be interesting to combine the Bench Beast’s rear unit with a simple (non-joystick) front pedestal rest. We’re intrigued with the Bench Beast’s rear unit, since there are few mass-produced, mechanical rear rests on the market. However, we have some concerns about the footprint, height, and overall size of the rear unit (SEE video 1:00-1:10). Ideally, a rear mechanical rest should allow the shooter to tuck in comfortably beside the gun. The Bench Beast has fat control knobs and tall support shafts placed far out from the centerline, on the extreme edges of the rear base. While the wide rear base provides a solid platform, the outboard support columns and control knobs, we believe, make it difficult for the shooter to position his upper body close to the gun. The main rear rest control knobs are also not conveniently placed. Look at the video carefully. Better rear rests have the controls further forward and closer to the centerline where they can be easily reached by the shooter’s non-trigger-pulling hand, in a comfortable shooting position. That way a right-handed shooter can easily use his left hand to work the controls while viewing the target through the scope, and holding the rifle grip with his right hand. We like the idea of an affordable rear mechanical rest, but we think the rear section of the Bench Beast would benefit from a major redesign. 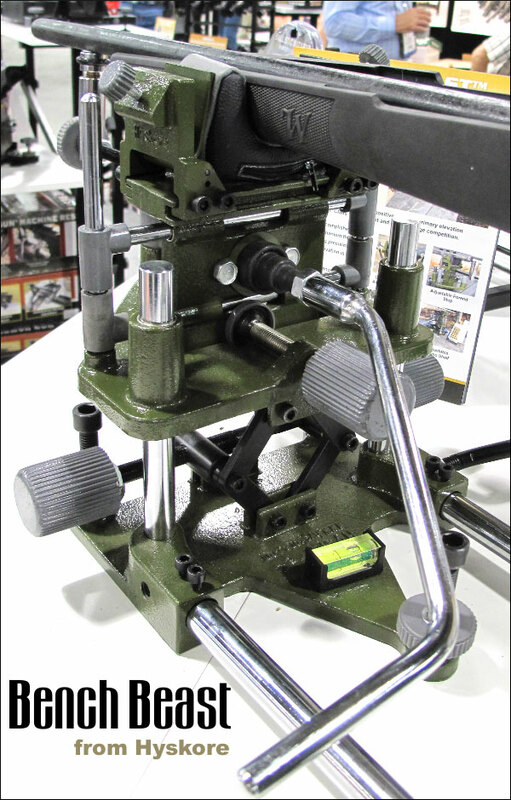 Share the post "Hyskore’s New “Bench Beast” Linked Front/Rear Rifle Rest"
On a more serious note, if you look at how high the rest sits, those that buy them had better have something pretty tall to sit on if they want their shoulders to align properly with their rifles’ butts.